This data set provides level 2 (L2) calibrated hourly precipitation (cm/hr) from rain gauges at seven North American sites as part of the Airborne Microwave Observatory of Subcanopy and Subsurface (AirMOSS) project. Three gauges were installed at each site. Initial sampling began at three sites in September 2011 and additional sites were added during 2012 and 2013. All sampling concluded in December 2015. 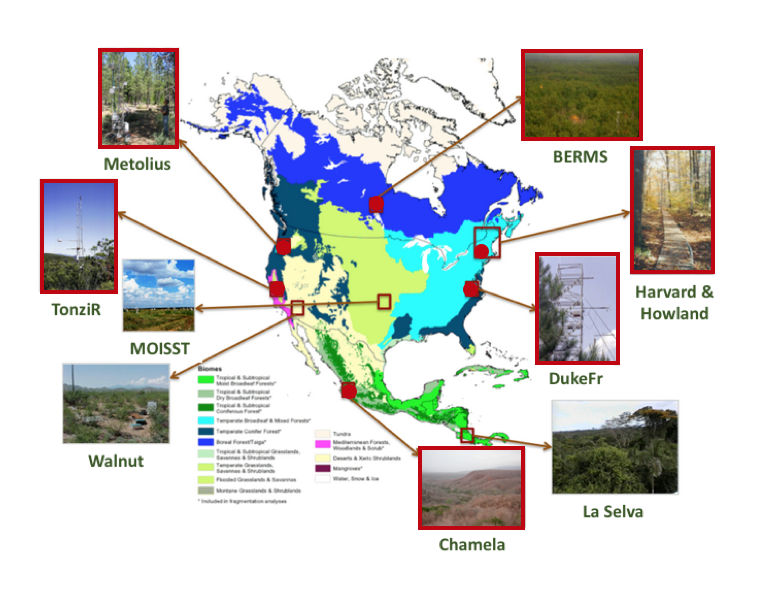 The AirMOSS project used an airborne radar instrument to estimate root-zone soil moisture at 10 study sites across North America. These precipitation data were collected in conjunction with in-ground soil moisture data in order to calibrate and validate the AirMOSS data. There are 29 files in NetCDF v4 (*.nc4) format with this data set. Figure 1: Precipitation measurements were taken at six of the ten AirMOSS sampling sites, highlighted here in red. A full list of AirMOSS data products is available at: https://airmoss.ornl.gov/dataproducts.html. Table 1. AirMOSS sites where in-ground soil moisture (IGSM) and precipitation were recorded. BERMS (Boreal Ecosystem Research and Monitoring Sites), Old Aspen site, Saskatchewan, Canada. BERMS (Boreal Ecosystem Research and Monitoring Sites), Old Jack Pine site, Saskatchewan, Canada. Chamela Biological Station, Jalisco, Mexico. Duke Forest site, North Carolina, USA. Harvard Forest site, Massachusetts, USA. Tonzi Ranch site, California, USA. Table 2. Data fields in the precipitation data files (e.g. L2PRECIP_calibrated_BERMSP_20120101_03.nc4). Note that precipitation data at the Tonzi Ranch site was recorded in an open field, not under the forest canopy as at the other sites. The Level 2 precipitation data were collected in conjunction with in-ground soil moisture data in order to calibrate and validate other, higher-level, AirMOSS data products including the Level 2/3 Root Zone Soil Moisture estimates for each AirMOSS flight (Cuenca et al., 2015). These data are provided with no QA information. The in-situ data were subjected to calibration procedures described in detail in Cuenca et al. (2015). The goal of the Airborne Microwave Observatory of Subcanopy and Subsurface (AirMOSS) investigation is to provide high-resolution observations of root-zone soil moisture over regions representative of the major North American climatic habitats (biomes), quantify the impact of variations in soil moisture on the estimation of regional carbon fluxes, and extrapolate the reduced-uncertainty estimates of regional carbon fluxes to the continental scale of North America. See Chapin et al. (2012) for more details. These Level 2 in-situ precipitation data are one set of products generated by the AirMOSS campaign. For AirMOSS, NASA's Uninhabited Aerial Vehicle Synthetic Aperture Radar (UAVSAR) was flown on a Gulfstream-III aircraft, making frequent flights over ten sites (given in Table 3) in 9 different biomes of North America over the course of four years. Precipitation was not measured at all sites. The objective of the in situ precipitation and soil profile instrumentation was specifically to monitor soil water content over a depth representative of that which will have an impact on the P-band radar signal. Each of the seven AirMOSS sites sampled (Table 1) had three monitored soil profiles with rain gauges installed approximately 40 to 50 m apart along a “representative” (in terms of soil texture and vegetation) transect within the footprint of the flux tower. Tipping bucket precipitation gauges were used to collect rainfall intensity and depth data. The Texas Electronics TE525 gauge was used primarily because it is durable, able to be deployed in remote areas, and can be connected to different recording devices. The main disadvantages of tipping bucket gauges are that there is loss of rainfall data during periods of high rainfall intensity (significant underestimation), strong winds, and during light drizzle (loss of rain water through evaporation). A calibration process was performed to estimate the uncertainty of data collected from the TE525 and to minimize these effects, particularly underestimation of precipitation during high intensity events. Calibration methods and additional details are available in Cuenca et al. (2015).